2.99" x 3.00" x 1.04"
The MD3 package consists of a 0.12" thick anodized aluminum extrusion. Use 2 or more screws in any of the four 0.16" diameter mounting holes. Typical mounting screw sizes are #4 or #6. The MD3 has an 8 pin and 12 pin pluggable screw terminal connectors and a 6 position RJ11 connector. Make sure that the terminal blocks are wired to the MD3 correctly before applying power. Do not allow the motor leads to short each other, to ground or to power as this could damage the MD3. The main motion control inputs of the MD3 are on J2 pins 2,3,4,5. These pins are electrically isolated to prevent noise from the motor drive from crossing over to the rest of the system. The isolator requires a separate 2.5V to 5.5V power supply on J2 pin 1 and pin 6. If a separate power supply is not available, the isolator can be powered by +5V generated by the MD3 on J2 pins 7 and pin 8, at the expense of noise isolation. All isolated logic inputs on J3 are pulled to the high (inactive) state by 5 kΩ resistors. To maintain close compatibility with the previous MD2S driver (which has 6/8 pin connectors), the pinout of the MD3 8/12 pin connectors is designed so that prewired MD2S screw terminal plugs can be plugged directly into the MD3 as shown below and function the same. Startup Delay There is a built in 2.5 second startup delay before the motor current is turned on and the drive responds to commands. Additional delay can be configured using the MD3 Demo program or with serial commands. During the Startup delay period, the Heartbeat and Current Cutback LED's will flash alternately. When this state ends, the drive will enter the "Normal operation" state. High performance stepper motors are designed with minimum winding resistance and inductance to minimize heat loss and maximize high speed torque. Motor torque at low speeds is directly proportional to the current setting and is not affected by power supply voltage or microstepping resolution. Torque remains relatively constant until it starts falling off at a speed threshold proportional to the power supply voltage. The MD3 can safely dissipate a sufficient amount of heat in free air for motor currents of 7A or less. The following table shows some typical housing temperatures after 24 hours of continuous operation without any additional heat sink. The metal housing of the MD3 can be kept cooler if it is mounted to a heat sinking metal surface or if the drive is operated intermittently. Be sure that the motor screw terminal connections on J3 are tight. Loose connections have a higher resistance which may cause excessive heating at the connector as the MD3 tries to maintain the peak phase currents at the specified levels. Unlike the MD2S, which uses jumpers and DIP switches for configuration, all configuation of the MD3 drive occurs over a RS485 serial port on P1. A USB to RS485 adapter (not included) is needed to connect a PC to the MD3. The serial port uses the Modbus RTU protocol. Modbus RTU is a simple, register-based command/response protocol. All MD3 settings such as phase current, microstepping, etc. are stored in thirty-two flash memory registers in the MD3. The MD3 User Guide gives full details on register read and write commands needed to configure the product. In addition to configuration, the serial port can also be used to send motion commands such as Move, Jog, Home, etc. so a host such as a PLC can control the MD3. The default register settings are listed in the MD3 User Guide. The default serial communication settings are: Modbus device address = 1, 9600 bps, 1 start bit, 8 data bits, even parity, 1 stop bit. The default stepper motor settings are 1A current and 1/8 microstep. US Digital provides the free MD3 Setup and MD3 Demo programs that provide a graphical user interface to the internal registers. The MD3 Setup program presents a simple interface for customers that want to configure the MD3 to function as US Digital’s existing MD2S-D or MD2S-P product. This program only allows the user to set options available on the MD2S-D or MD2S-P. The MD3 Demo program gives the user full control of all the features of the MD3. The MD3 is a stepper motor driver with an integrated motion controller that is capable of driving size 14 to 42 stepper motors from 2 to 256 microsteps per step. Peak motor currents are selectable from 0.5 to 7.0 Amps per phase for the H-option version. The L-option provides selectable current from 0.05 to 1.8 Amps per phase. The MD3 is powered by a single supply voltage from 9 to 50 VDC. The MD3 can be configured and controlled using the open MODBUS RTU protocol over an RS485 bus. US Digital's free MD3 Setup and MD3 Demo program can be used to configure and control the drive using a graphical user interface. 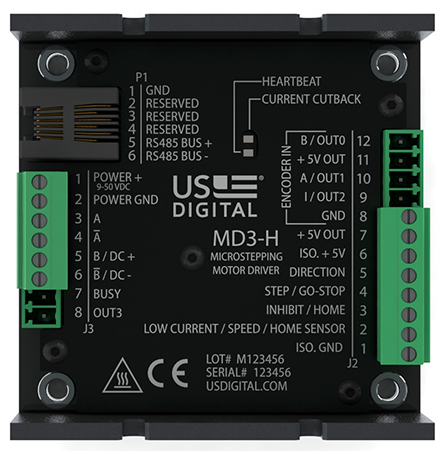 The MD3 can be configured to be mostly compatible with US Digital's existing MD2S-D and MD2S-P motor drivers. The pre-wired connector plugs from these existing products can be plugged in as-is to the larger MD3 connectors. The register interface is published so that user can write their own control software for the MD3. Multiple MD3 units can be connected to the same RS485 bus since each unit can be assigned a unique device address. The MD3 has built-in thermal shutdown to protect the drive from overheating and is firmware updatable by the end user. The MD3 has isolated step/direction or go-stop/direction digital inputs. In addition, the integrated motion controller allows Profile and Jog moves with user-specified acceleration, speed and number of steps. The drive also supports a switch or incremental encoder index home cycle with pre- and post- home offset movement options. The Home cycle can run automatically on startup after a programmable delay or on command. All motion commands can be started using the isolated digital input lines in addition to MODBUS commands.